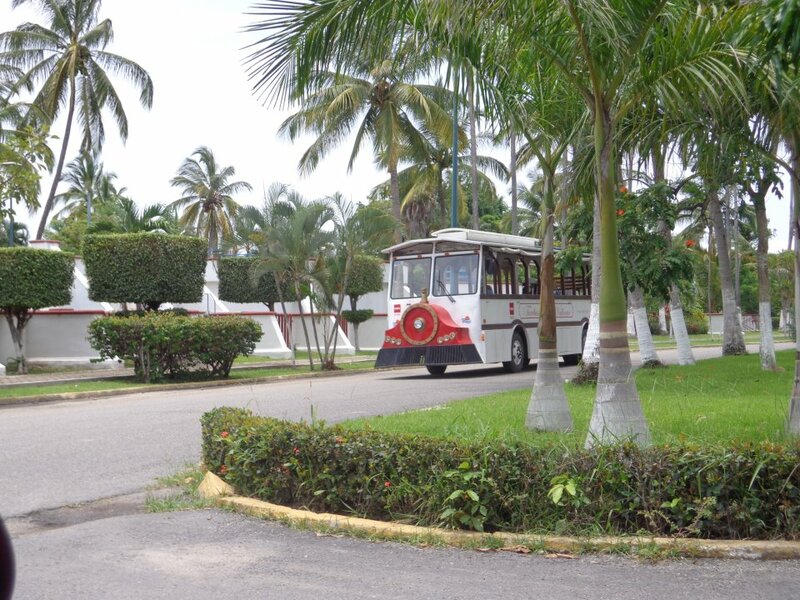 This is the FREE trolly that circulates through Nuevo Vallarta. At this time the trolly’s route does not extend into the Flamingos section of the neighborhood. Traveling across the Jalisco state line into the neighboring state of Nayarit flocks of international visitors head straight for beautiful, relaxing Nuevo Vallarta / Flamingos. Conveniently, this popular Mexico beachfront destination is just 15 minutes north of Puerto Vallarta and only 8 miles from Mexico’s PVR international airport. Nuevo Vallarta / Flamingos is not a city or town but instead a prestigious master-planned resort community with all new modern construction intermixed with plenty of lush tropical ambiance. The north end of the neighborhood is the Flamingos section of Nuevo Vallarta. For vacationers arriving for sun-and-fun holidays in and around Banderas Bay, this area is often viewed as an extension of the city of Puerto Vallarta. It should be noted however, that transportation to the lively and historic Malecon section of Puerto Vallarta will take 45 minutes aboard a public bus, or approximately 25 minutes by taxi or rental car. In addition to several fabulous golf courses, one of the biggest draws to Nuevo Vallarta is its famous Flamingos Beach which stretches from Bucerias at the north end to Paradise Village at the south end. The ocean waves fronting Flamingos Beach are gentler along this stretch of Banderas Bay, and are therefore more conducive to swimming, boogie boarding, body surfing, and kayaking. The area is surrounded by abundant tropical vegetation, and has the nicest, longest and flattest walking beach on the entire coast. In fact, Flamingos Beach is nearly 8 miles long, and at its widest point is 50-60 feet wide. Visitors who are focused on experiencing relaxing beach vacations away from the hustle and bustle of city life choose Nuevo Vallarta for its beautiful, serene and expansive Flamingos Beach. Because there are no obstructions such as rocks, jetties or boulders, this beach is perfect for refreshing early morning jogs, and long romantic evening walks. In this area you can wade out quite far into the ocean with the water remaining only waist or chest deep. It’s a real treat for swimmers or waders to then turn around in the ocean and face inland to take in a panoramic view of the spectacular Sierra Madre Mountains and its lush, green jungle foliage. On any given day, you will see sun-kissed residents and guests lounging in recliners and under palapas on the soft golden sand of Flamingo beach in front of Nuevo Vallarta’s well-manicured condos and resorts, while others swim, sail Hobie Cats, kayak, body board, parasail, kite surf, jet-ski and frolic in the warm ocean water. Due to its rapid development and expansion over the past 20 years, Nuevo Vallarta has become a full-fledged, favored tourist destination in its own right. 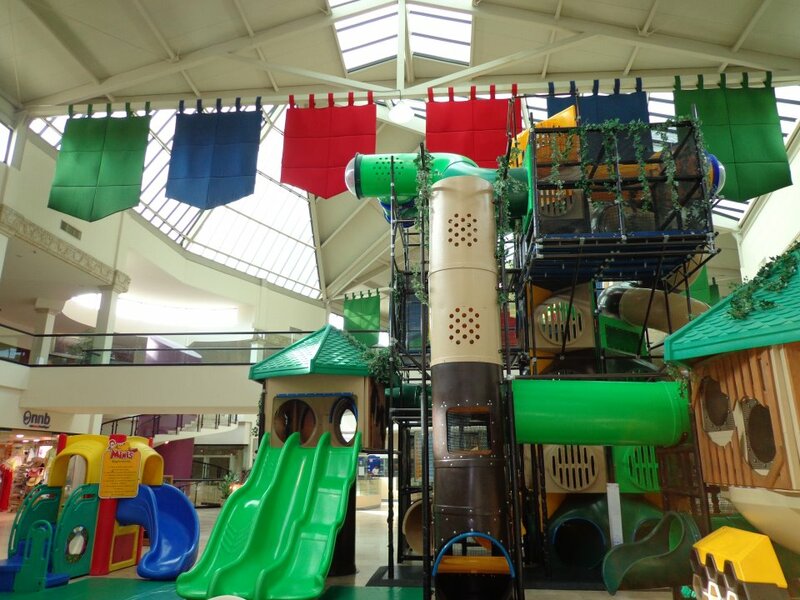 This continuously growing neighborhood has the bright and airy two-story Paradise Plaza Mall which offers a Starbucks, a few restaurants, a deli, an ice cream shop, as well as a small food court that consists of McDonalds, Dominos Pizza and Subway. 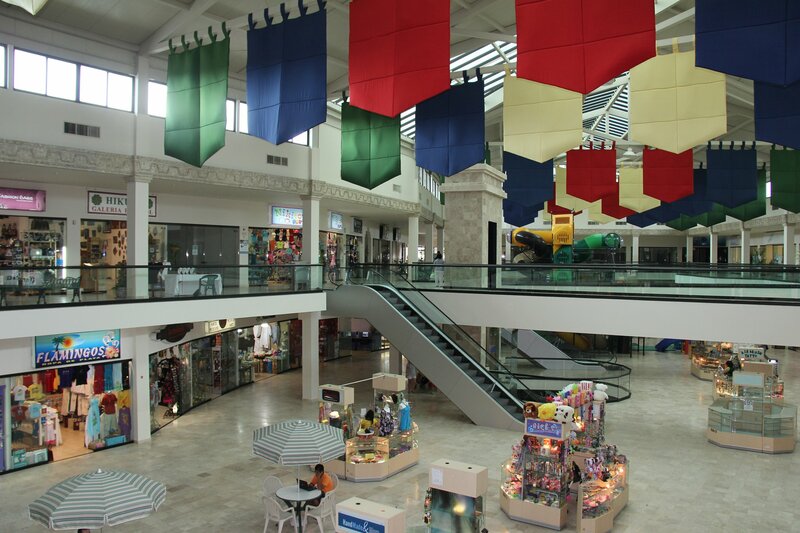 The mall has a clean and well-maintained children’s playground near the food court, a self-service laundry mat, real estate offices, jewelry kiosks, men and women’s clothing boutiques, souvenir shops, a colorful Huichol art gallery full of beautiful and unique offerings, San Javier 24-hour emergency medical clinic, and several other businesses. Paradise Plaza Mall has an elevator as well as an escalator. Public bathrooms are located on the ground floor of the mall not far from the food court and the arcade. The U.S. Consulate is located on the second floor of Paradise Plaza Mall, as is the main office for the Children of the Dump charity, a small but well-stocked book store, and the Nayarit tourism office which is a great place for visitors to stop by to ask questions of the friendly official manning the front desk or to pick up several informative brochures, magazines, and maps of the general area. On the ground floor of the Paradise Plaza Mall is the lovely Sunset Market which is a full grocery store that carries a wide range of American food brands and products in addition to Mexican brand items, beach toys, flip flops, sunscreen and bug spray. Sunrise Market also has its very own pharmacy, although from personal experience their prices tend to be much higher than other pharmacies in the area. Dining options in Nuevo Vallarta are quite extensive. 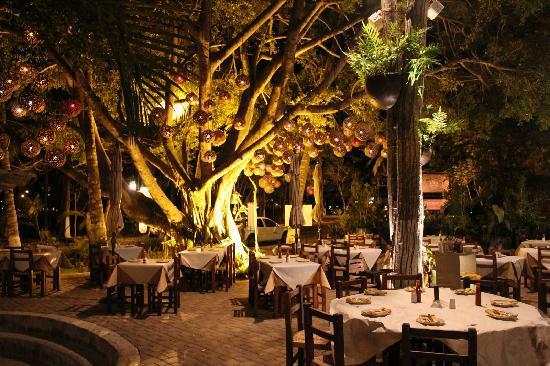 Currently, there are more than 70 different restaurants in the Nuevo Vallarta area. Whether you are vacationing at a condo or an all-inclusive resort and want to go off property to eat a meal out, there are plenty of great eateries to choose from! A gem of Nuevo Vallarta is San Javier Hospital which is a newly opened state-of-the-art facility that caters to the booming business of medical tourism, and offers comprehensive medical care. Their diagnostic area offers computed tomography (CT), ultrasound, conventional X-ray and fluoroscopy, Arc in “C”, mammography, a 24-hour clinical laboratory, and receives blood bank support from its sister location, San Javier Hospital in the Marina neighborhood of Puerto Vallarta. It has a treatment area for hemodialysis with a capcity for 8 machines. There are two operating rooms equipped to perform any type of procedure, including bariatric surgery. Maximum care is given to critically-ill patients in two adult intensive-care units. 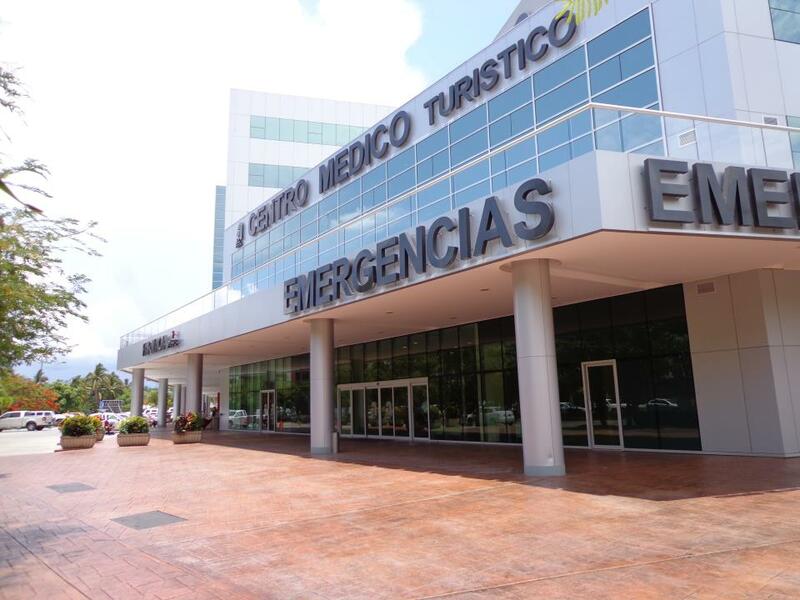 San Javier Hospital has a 24/7 emergency staff, and is equipped to provide emergency triage care. 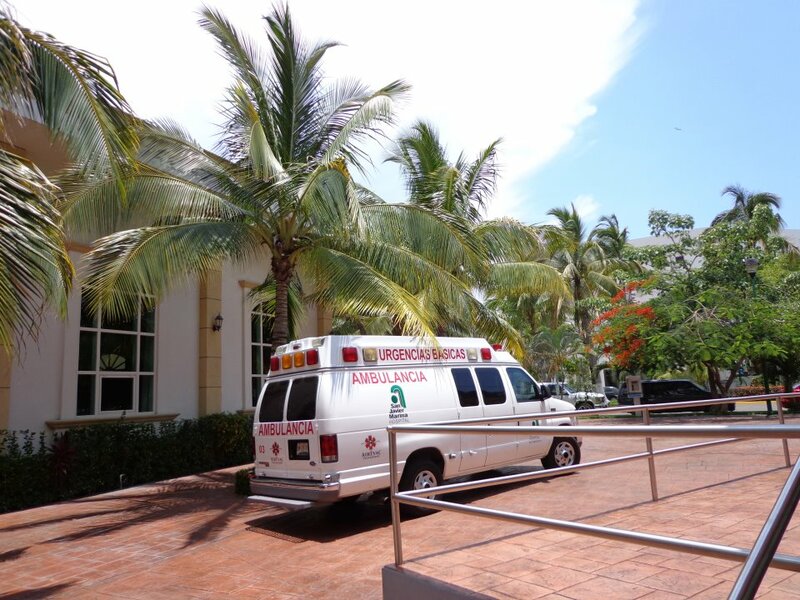 The hospital has 2 ambulances, including one equipped for critical care. Hospital accommodations include 8 standard adult suites, 2 master suites for patients with bariatric procedures, and 1 standard suite for pediatric. There are spacious and comfortable waiting rooms, ample parking, and an on-site pharmacy which is open 24 hours. 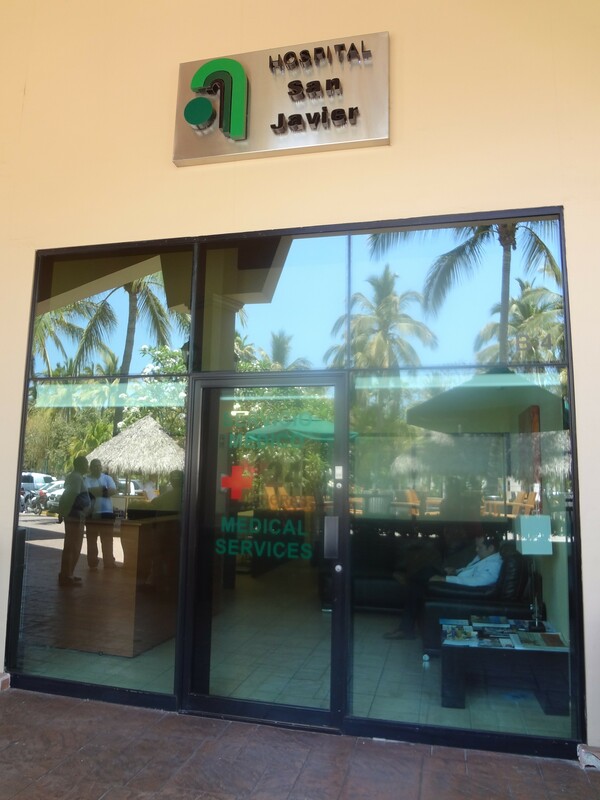 In addition to San Javier Hospital, there are a few 24-hour medical clinics located throughout the sprawling community of Nuevo Vallarta. And with several pharmacies in the area, filling prescriptions is quick and easy. 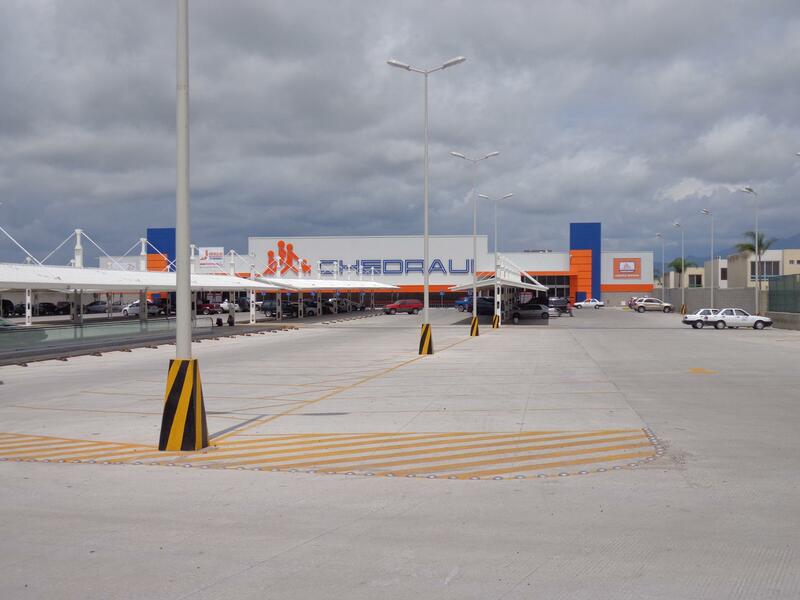 As well as the pharmacy within the San Javier Hospital, there are two nearby Farmacia Guadalajara locations (one by the highway and not far from the second entrance to Nuevo Vallarta, and another at the south end of Bucerias), the pharmacy at Sunset Market in Paradise Plaza Mall, and pharmacies at MEGA, Walmart, and Sam’s Club. Banamex Bank and ATM at Paradise Plaza Mall, Banorte Bank and ATM next to San Javier Hospital, and a Cashola ATM in the parking lot of San Javier Hospital. 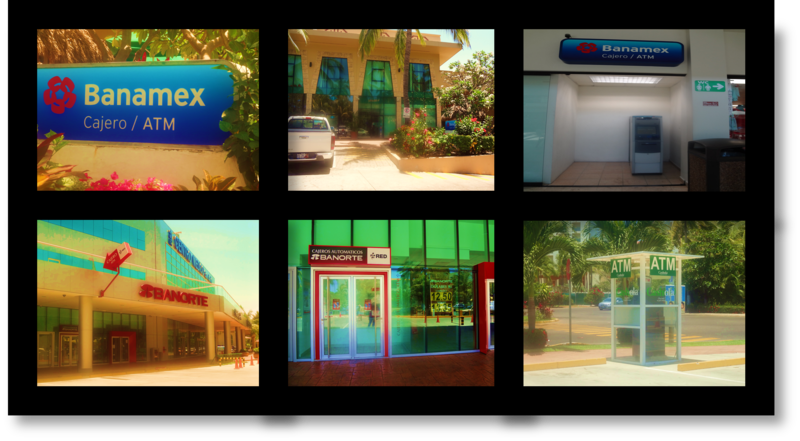 A full-service Banamex bank is located at the Paradise Plaza shopping mall. Additionally, two Banamex ATMs are at Paradise Plaza mall, one interior of the mall on the first floor down from Subway, and another is situated exterior of the building. A full-service Banorte bank is in the Centro Empresarial building right between the Grand Odyssey Casino and San Javier Hospital. Banorte also has an ATM machine right outside the bank. A Cashola ATM is situated at the north-west corner of the Centro Empresarial parking lot. Security guards are stationed nearby to oversee the buildings as well as all of these bank and ATM locations. Closer to the marina area in Nuevo Vallarta is a Sun Market convenience store which has a Santander ATM inside. The Sun Market is located outside the Mayan Sea Garden Resort on Paseo de las Moras s/n, across the street from a covered taxi stand and also across from the OXXO store which is walking distance from the first public entrance point to Flamingos Beach. At the second public entrance point to Flamingos Beach on Blvd. 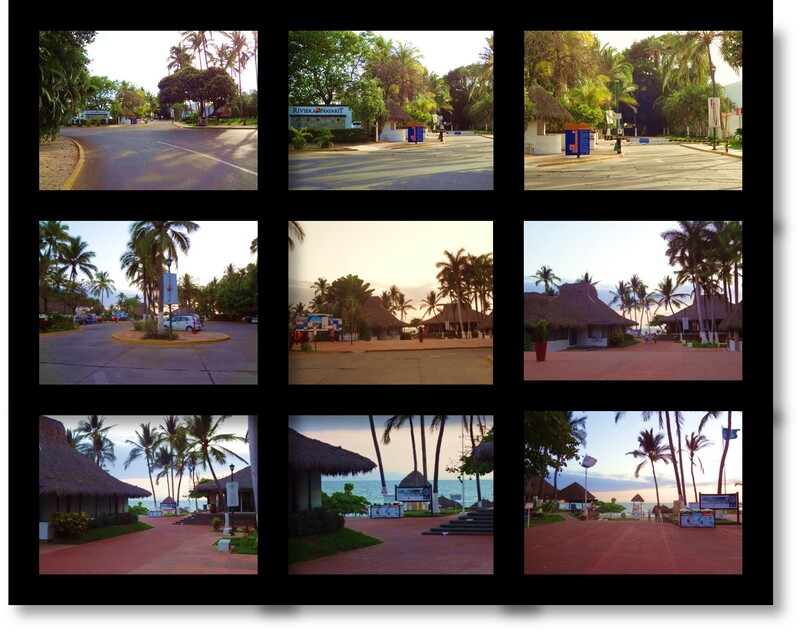 Nayarit by the Marival (just south of the Grand Velas Resort and across from the round-about on Blvd. Nayarit), there is a Scotiabank ATM that is clearly visible from the street. 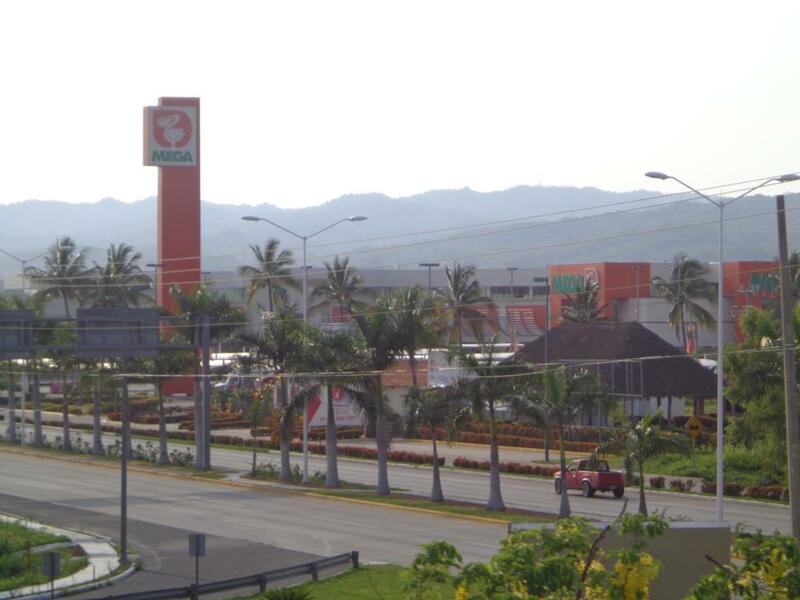 MEGA shopping center in Nuevo Vallarta where a variety of Banks and ATM machines are located. At the MEGA grocery store complex located across Highway 200 (a $60 pesos taxi ride from Flamingos, or a 20/30 minute walk from Flamingos depending on which condo complex or resort you are staying at) there are a strip of banks and ATM machines adjacent to MEGA and facing the parking lot. Banks include Scotiabank, Actinver, Intercam (money exchange bank), and Banamex/Citibank. Within MEGA across from the cash registers there is a Nextel ATM. Additionally, inside MEGA next to the bathrooms there are more ATM machines to include: Banamex, Santander, HSBC and Bancomer. Within the Flamingos section of Nuevo Vallarta, there is an ATM machine at the little market outside the main entrance lobby of the resort property Villa del Palmar Flamingos. Even if you are not staying at this resort property if you let the security guards know that you’d just like to shop at the market and/or use the ATM machine they will allow access for this purpose. Inside Sam’s Club in Nuevo Vallarta, Mexico there is a Banco Walmart ATM machine. 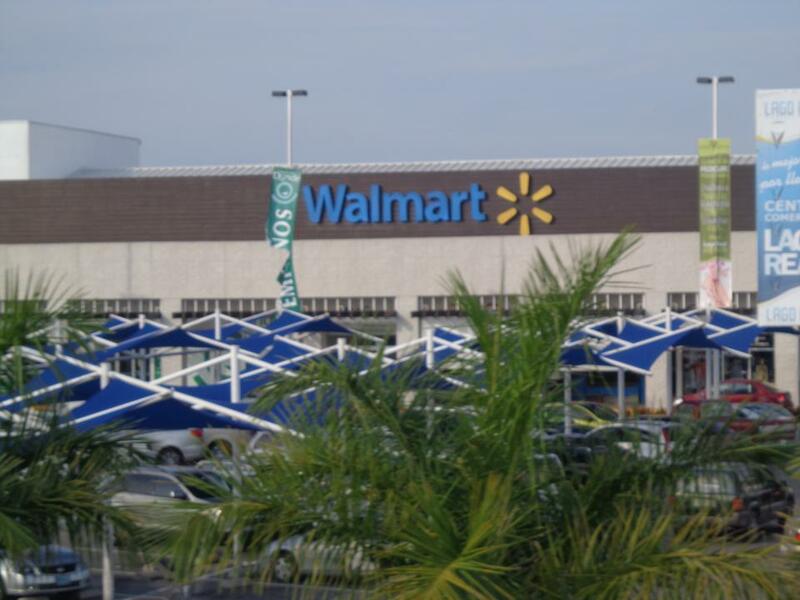 Across Highway 200, between Nuevo Vallarta and Mezcales, is the expansive Lago Real Shopping Center (also known as Walmart Plaza) that has additional ATM machine options, including Banorte. 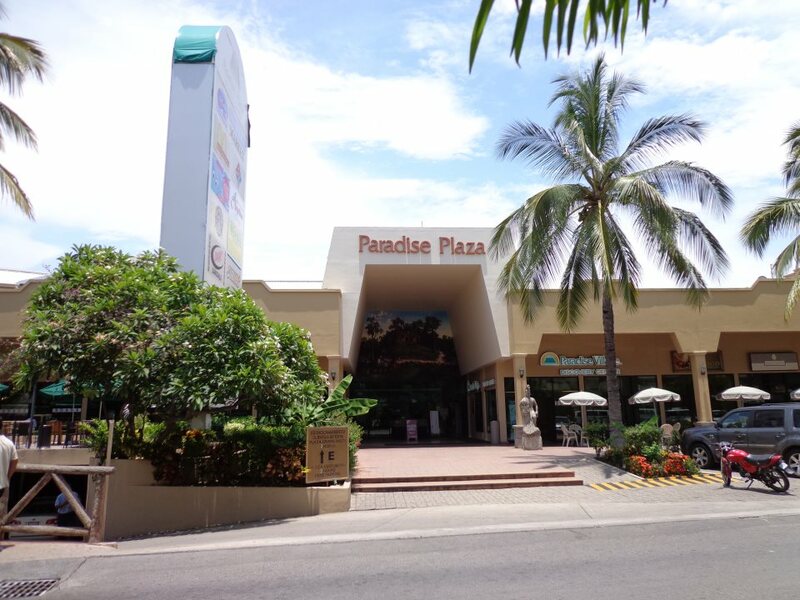 Within the Paradise Plaza Mall, right next to Starbucks, is the Hospital San Javier Emergency Medical Clinic (Paradise Plaza, Local B-4). The clinic’s phone number is: 322.297.0595. Our family loves this clinic as their doctors make house calls! So you can either stop by their clinic for treatment, or they will be happy to come to your condo or hotel room. There are 10 doctors that rotate shifts with the center being staffed by two physicians at a time, 24 hours a day. The doctors that we interviewed to make sure our information remains current were Dr. Israel Velazquez and Dr. Monica Becerra; like the other doctors who we’ve interacted with at this clinic in the past, both spoke great English. At the clinic they accept Visa and Mastercard in addition to cash, but for house calls it is cash only. Our family and friends have used this clinic’s services three times with great results. One occasion was a friend who arrived in PV not feeling well, and another occasion was a friend who was pinched by a crab on the pier of Boca de Tomatlan and the red welt started to really itch. The last occasion was when a family member fell down and cut themselves and needed nine stitches. The total cost for the stitches, including a subsequent appointment two weeks later to have them removed, was $95 USD. A medical form is provided so that when you go back home you can submit it to your medical plan for reimbursement. 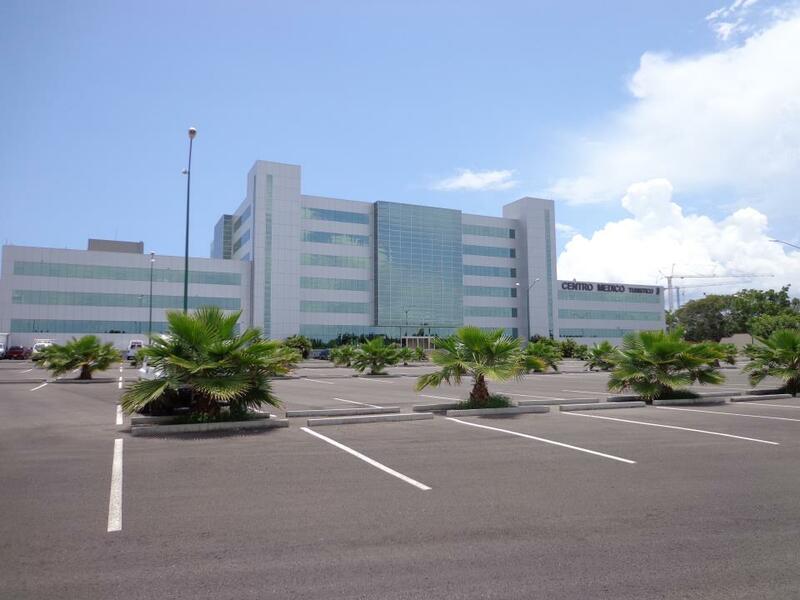 Sharing a portion of the large and modern Centro Empresarial building with San Javier Hospital (which is just down the street from their 24-hour emergency medical clinic next to Starbucks in the Paradise Plaza Mall) are a few businesses to include the Grand Odyssey Casino which opened its doors in May of 2013. In grand and flashy Las Vegas style, The Grand Odyssey Casino offers Sports Book, live tables (roulette, Black Jack, craps and poker), and has numerous slot machines, bingo machines, as well as a restaurant and bar. This is a very clean, bright and modern casino with all new machines. For those who are not familiar with casino games, you’ll have an excellent opportunity to learn. 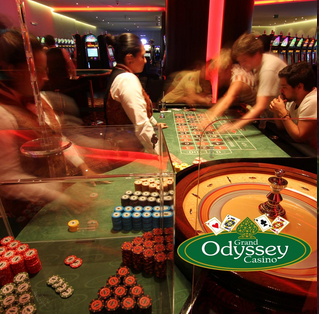 Each evening the Grand Odyssey Casino offers free lessons on how to play the live gaming tables. To further amplify the fun, this beautiful casino offers a series of both ongoing and changing promotions. The Grand Odyssey Casino staff is friendly and attentive, and guests will appreciate the fact that smoking within the casino is limited to a specific section. This luxury facility provides ample private parking, with valet parking also available. Visitors to Nuevo Vallarta can now enjoy a little slice of Vegas with the bright lights and lively casino action just a short walk or taxi ride down the street from their comfortable condo or beachfront resort accommodations. Conveniently, there are two different bank ATM machines at the Centro Empresarial Building. A Banorte ATM is right next to the Grand Odyssey Casino while a Cashola ATM is located across the way within the parking lot. There is 24-hour security at this location, so it’s safe to withdraw funds at either ATM both day and night. Refreshingly, there are two beautiful water slide parks in Nuevo Vallarta, Mexico. 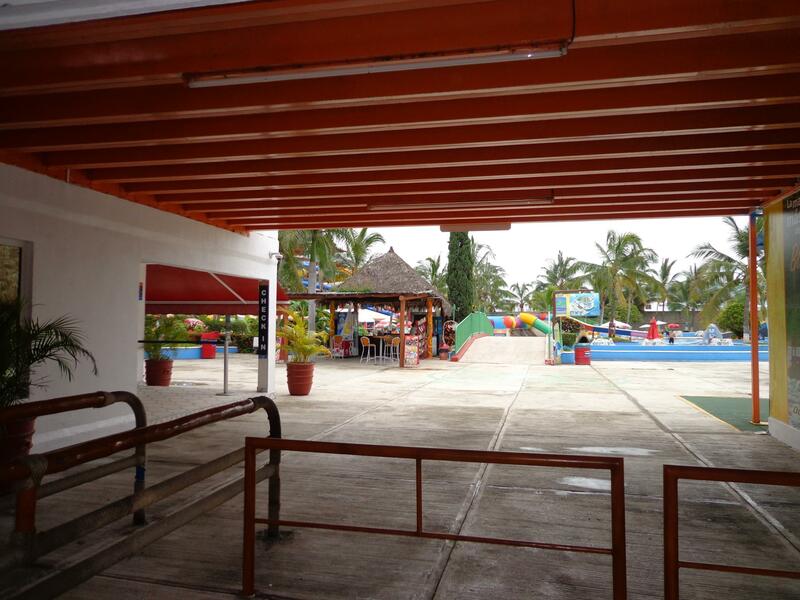 When driving from Puerto Vallarta to Nuevo Vallarta, both of the water parks are located at the first (or southern) entrance to Nuevo Vallarta. Aquaventuras Water Park is on the east side of the highway, while Splash Water Park is on the west side (beach side) of the highway. AQUAVENTURAS WATER PARK in Nuevo Vallarta is located just 10 minutes from the PVR aiport at the first entrance to Nuevo Vallarta. It’s on the right-hand side when exiting the freeway, just behind the tall, white Eurowindows building. This really fun water park offers daily dolphin and sea lion shows, and 10 exciting water slides. There is a Water World children’s area with a pirate ship, low-speed mini water tobagans and a kiddie paddling pool. The facility is further enhanced by a lazy river, a snack bar, swimming pools and lounge areas. 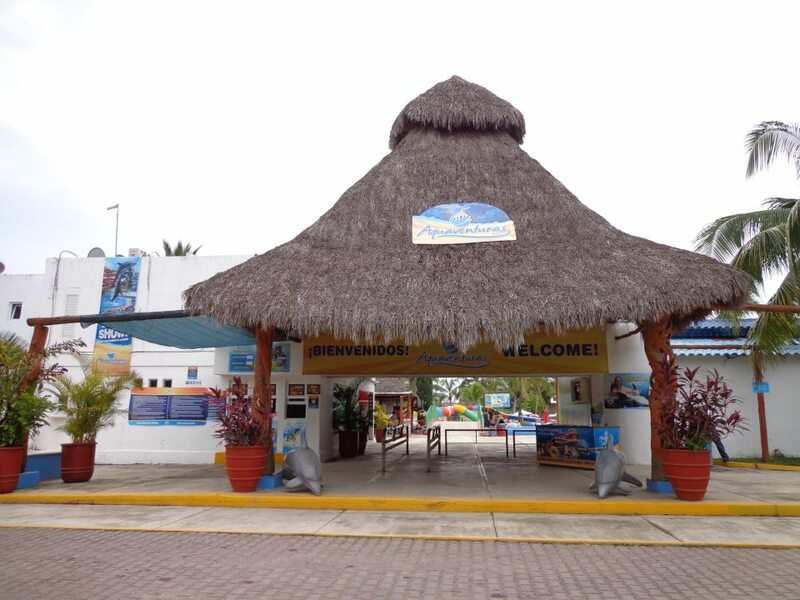 Separately, Aquaventuras has a swim-with-dolphins program. SPLASH WATER PARK is a beautiful, new and modern facility. Rides include both water slides and tube rides. There is a special kids’ zone as well as a lazy river. Interactive dolphin swim programs are very popular at this facility, as are the dolphin, seal and sea lion shows. There is also a very large area with gardens a kids’ playground and sandbox, as well as special areas for beach volleyball, soccer, and basketball. Adjacent to the water park is Splash Hotel. For travelers arriving a day or two before their resort check-in date, a brief stay at the clean and basic Splash Hotel may be a good option, especially for families with teens or children who would love the convenience of having a full-scale water park next to their hotel accommodations. 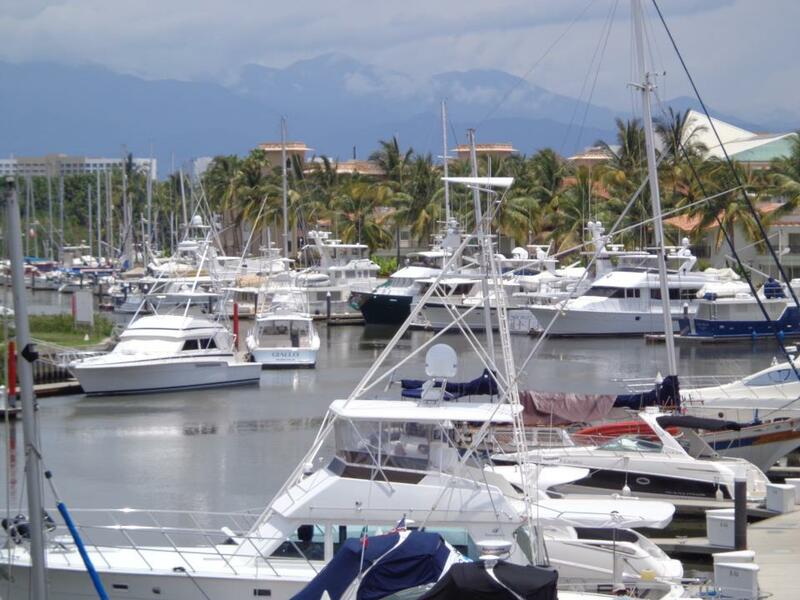 Nuevo Vallarta, Mexico is home to the Paradise Village Marina and Yacht Club which offers world-class services, 200 berths from 26 feet to 240 feet, and is headquarters to the Banderas Bay Regatta. Paradise Village Marina also hosts other important international sailing events ranging from San Diego’s YCs Vallarta Race to the J24 World Championships. Tourists and local residents not owning a vessel can take advantage of their fleet of charter boats for deep-sea fishing or pleasure cruising. Each and every year VIP visitors to Paradise Village Marina and Yacht Club range from presidents to some of the wealthiest people in the world. A second marina in Nuevo Vallarta is the brand new Marina Nuevo Vallarta which is still expanding with an expected finalized capacity for 244 vessels from 25 feet to over 90 feet in length. A great selection of restaurants, many with excellent views of the boats and water, line the boardwalk of the lovely Marina Nuevo Vallarta. There is also a nearby OXXO for snacks and cold drinks. Within this area luxury condo complexes overlooking the marina have excellent views. Nuevo Vallarta is extremely proud to be the home base of Vallarta Adventures, Mexico’s premier adventure company and the largest tour operator in Banderas Bay. Inspired by nature, the company was started 16 years ago as a safe, fun and informative adventure for visitors who want to explore all the area has to offer. Popular tours include the famous Rhythms of the Night, Las Caletas Beach Hideaway, Luxury Sailing, Extreme Zip Line Tours, Sea Safari, Offroad Adventure, Outdoor Adventure, Scuba Diving, Marietas Eco Discovery, Surfing Safari, land tours to San Sebastian Del Oeste, and ocean tours to Yelapa & Majahuitas. While Vallarta Adventure’s main location is on Ave. Las Palmas, their second Nuevo Vallarta location is within the Marina Nuevo Vallarta area which is conveniently just across the water from their main location. The second location houses their Dolphin Adventure facility where they offer specialized programs for swimming with dolphins and sea lions. For an truly unforgettable vacation experience, it’s highly recommended that you schedule at least one Vallarta Adventures tour during your upcoming holiday. From high-octane thrills to candle-lit enchantment, Vallarta Adventures has it all. And with the wide selection of tours offered, there’s something special for everyone. In addition to all of these Nuevo Vallarta activities and attractions, the neighborhood along Paseo de los Cocoteros consists of beautiful high-rise condo complexes intermixed with sumptuous and sprawling all-inclusive resorts. 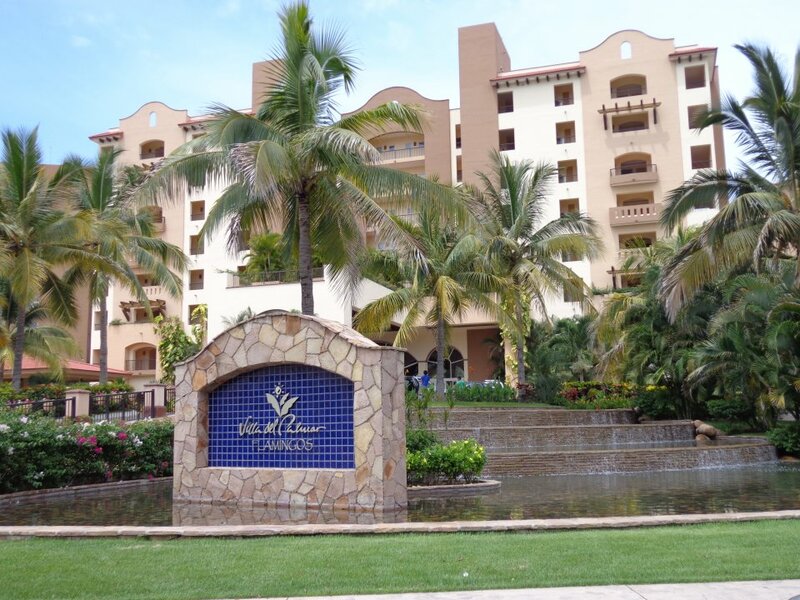 These beachfront properties are very popular with international vacationers and include Paradise Village resort complex, Hard Rock Vallarta, Grand Velas, Riu Jalisco, Riu Vallarta, Riu Palace, Villa del Palmar Flamingos, and many more. The numerous condo complexes within Nuevo Vallarta consist of beautifully-furnished units, many of which are offered as vacation rentals by owner. 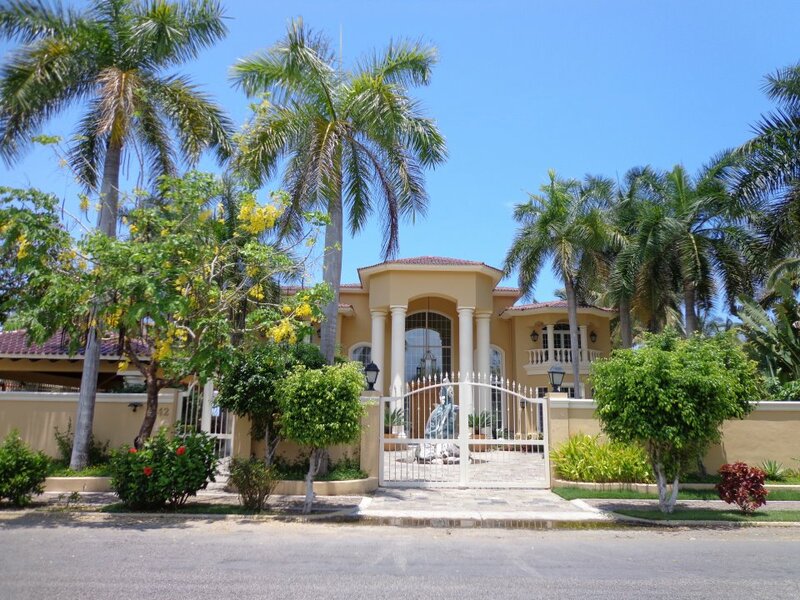 Off the main beachfront resort strip of Paseo de los Cocoteros, there is an extensive series of gorgeous palm-tree lined streets, some crossing over bridges within the neighborhood, and incredibly massive single-family homes with unique modern/tropical architecture. Gorgeous green golf courses wind through the sprawling neighborhood, and more than 60 different restaurants are available in this beautiful, safe, and well-paved community. As a flood of American and Canadian Baby Boomers reach retirement and start flocking south for the winter, the more popular resorts and condos in Nuevo Vallarta / Flamingos tend to book up fast. For the high-season months of November through April, it’s not uncommon for long-term-stay rental condo reservations to be made a full 12 months in advance in order to secure the very best accommodations for the following year. 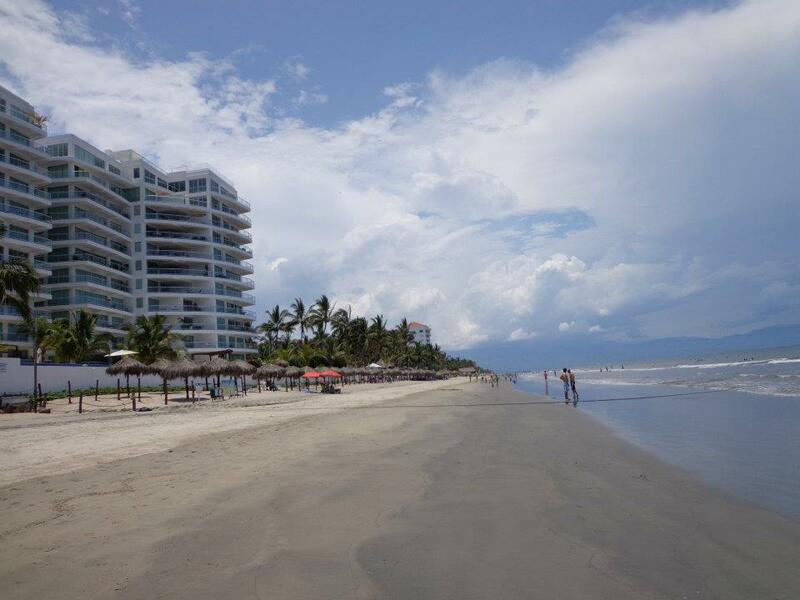 In addition to being a favorite resort area for international vacationers, Nuevo Vallarta / Flamingos is also a popular coastal choice for many well-to-do Mexican nationals from Guadalajara and Tepic who look forward to getting away from their hectic big-city lives to enjoy long relaxing weekends and holidays at this prime beach location with their families. Many of these Mexican nationals, as well as foreigners, own the large sumptuous homes with lovely sailboats and yachts docked in the waterways off their backyards. 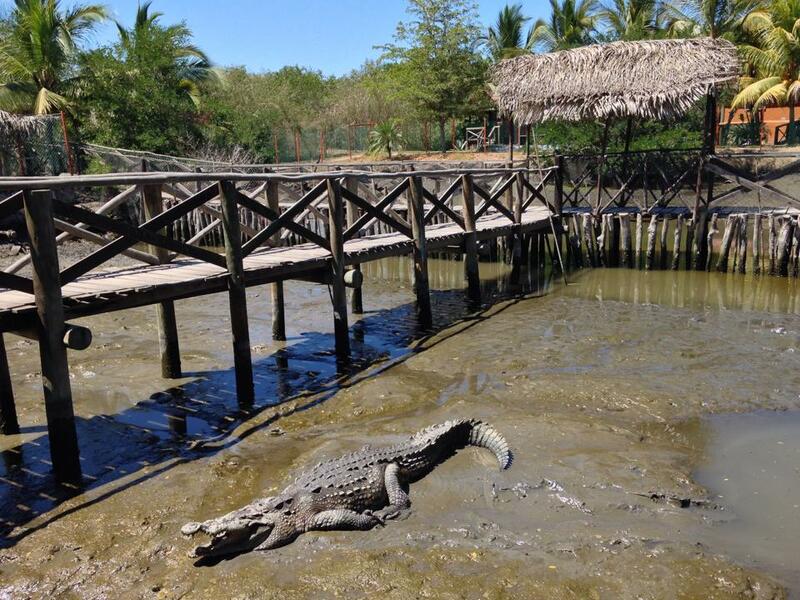 Nature and adventure meld together for those engaging in a tour of El Cora Crocodile Sanctuary in Nuevo Vallarta, Nayarit. Located right off of Mexico highway 200, just 150 meters south of the Flamingos Golf Club. This stretch of the highway is also called: Carretera Puerto Vallarta-Tepic, and the Flamingos Golf Course is marked by a giant white golf ball on top of a tee. 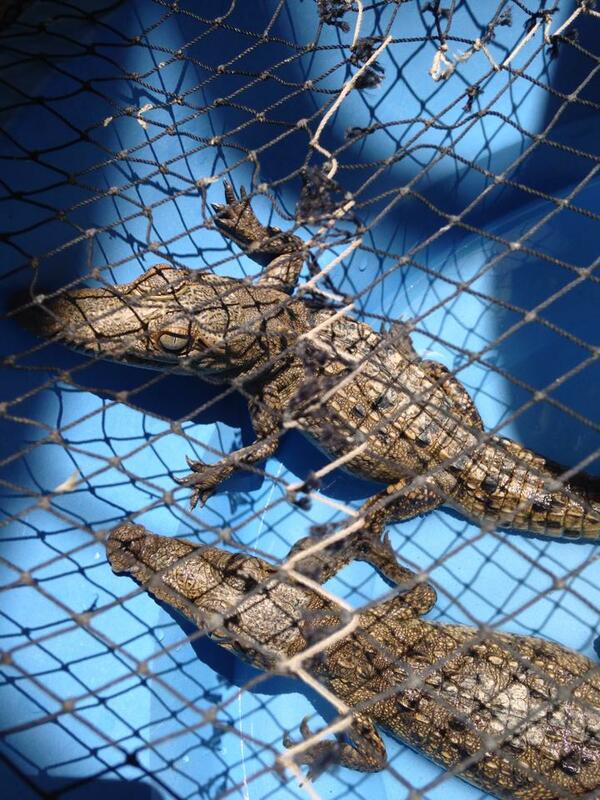 Look for a small sign showing a drawing of a crocodile along with the words “Cocodrilario El Cora”. Turning onto the one-lane unpaved rural road, drive down about 2 kilometers. For access to this beautiful protected habitat, the per person entrance fee is a donation of $20 pesos (2014). 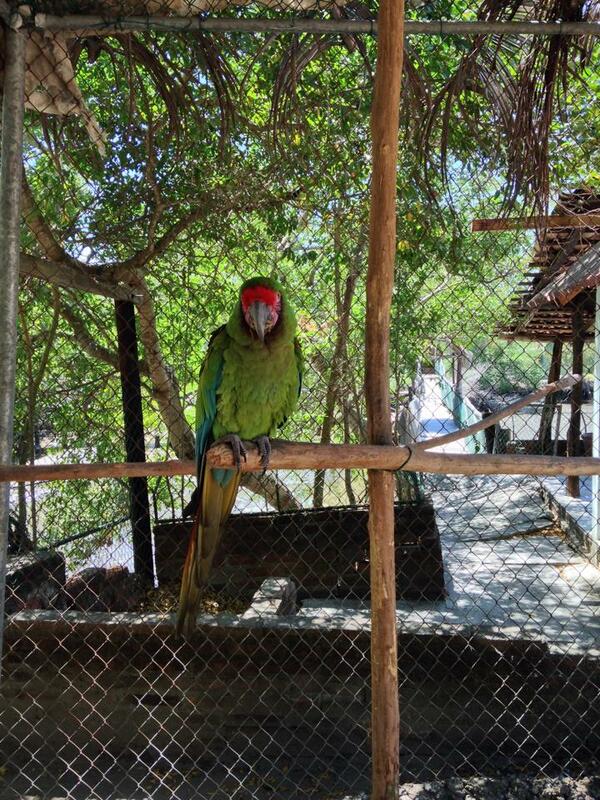 There are numerous other animals that can be viewed at El Cora sanctuary including a tejon (Mexican raccoon), turtles, parrots, geese, chickens and other birds. 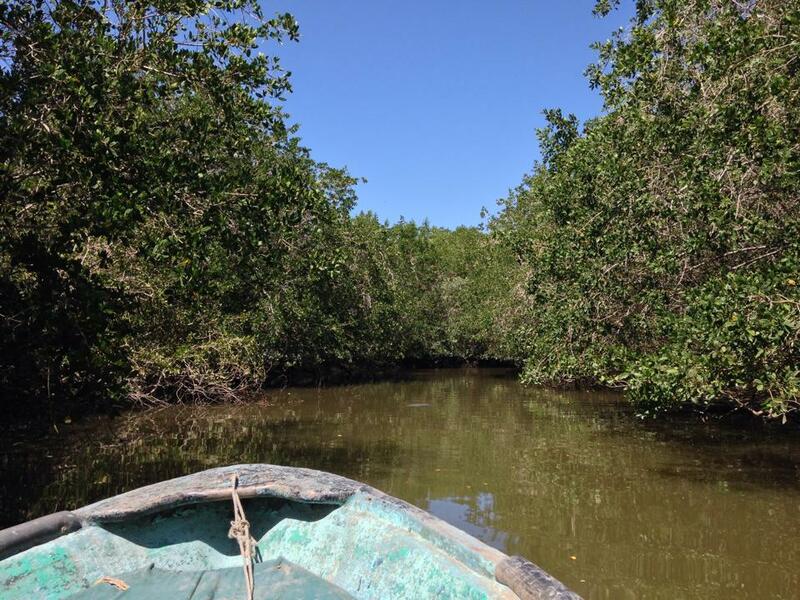 The sanctuary also offers interesting one-hour swamp tours in a small boat. The cost of the tour is $200 pesos per person (before tipping the friendly captain). 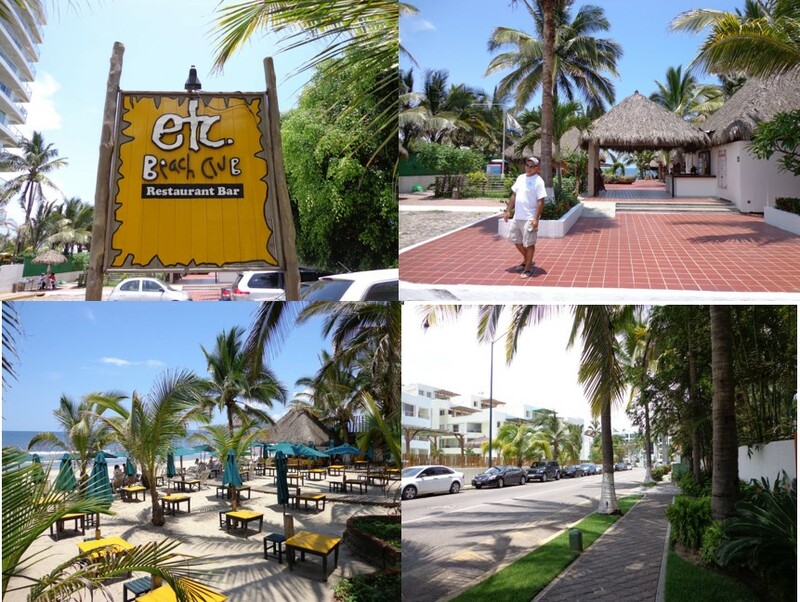 Before leaving El Cora, be sure to enjoy a delicious meal and refreshing drinks at their lovely and comfortable on-site, open-air restaurant specializing in seafood. All profits from the entrance fee, boat tours and restaurant benefit the sanctuary. Dining options In Nuevo Vallarta are numerous as there are now more than 70 different restaurants in the area. While many restaurants such as Por Que No?, Porto Bello, Prime 159, Eddie’s Place Nopal Beach, Wine & Burger, Mariscos 8 Tostadas, Manao Cebicheria, etc. are located around the marina, and others such as Derby City Burger, La Dolce Vita, Ginger, Mr. Creams’s Pancake & Waffles are located in Plaza 3.14. Adding to that selection several eateries are located at Paradise Plaza Mall, while a variety of different restaurants are sprinkled throughout Nuevo Vallarta neighborhood. 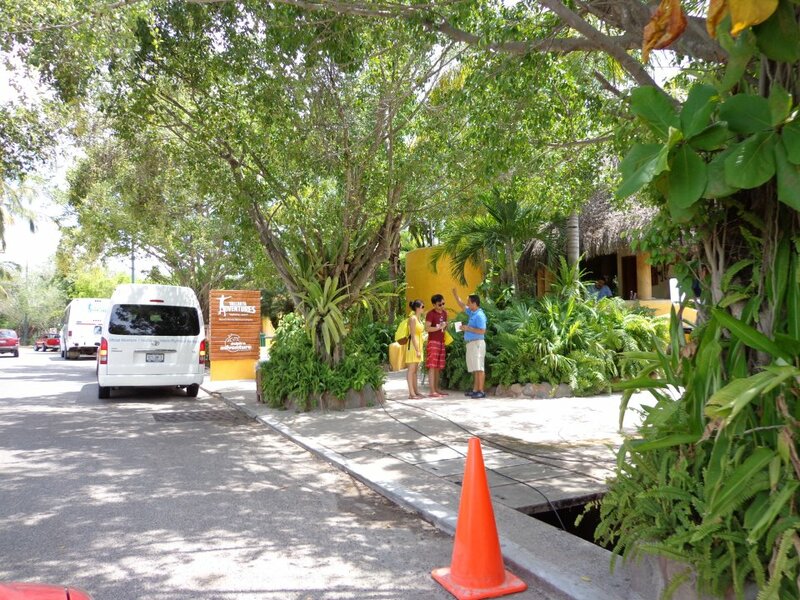 And quite conveniently, several eateries in Nuevo Vallarta now offer delivery service to your condo or resort. And additional dining options are available in the nearby town of Bucerias which is a nice walk down the beach, or a quick taxi ride away. With the large number of resorts in the area, Taxis are plentiful throughout the entire Nuevo Vallarta and Flamingos area. And stocking up on groceries is easy. For those at the north end of the neighborhood in Flamingos, the giant Mexican supermarket chain MEGA is within walking distance or an affordable $60 pesos taxi ride. Many vacationers staying in the Flamingos area walk to MEGA and then take a taxi back with their groceries. There are always taxis stationed right in front of MEGA. For those staying at the south end of Nuevo Vallarta, Sunset Market in Paradise Plaza Mall is the more convenient but a somewhat more pricey option. Other major stores in the area for stocking up on food, drinks and supplies are Chedraui, Sam’s Club and Walmart. And speaking of Walmart, if you’d like to take in a first-run Hollywood film in either English or Spanish for the equivalent of about $3.75 USD per ticket there is Cineopolis, a full-size modern theater in the Walmart complex. For those wishing to take a water taxi from Nuevo Vallarta to Los Muertos Beach in Puerto Vallarta, there is a small tourist information booth located right next to (south of) the Paradise Plaza Mall. This information booth is usually manned by one or two timeshare representatives from the Paradise Village resort complex. In addition to offering timeshare information, one of their services is making arrangements for water taxi transportation to and from Puerto Vallarta. During the high-season months the water taxi shuttle service is available every day, every hour. In 2014, the water taxi rate was the equivalent of $14 USD per person one way, or $22 USD per person round trip. During the summer months (low season) the water taxi shuttle service is by reservation only and requires a minimum of 4 passengers each way. Additional water taxi services can be found along the Nuevo Vallarta Marina area across from Eddie’s Place Nopal Beach Restaurant; here there are water taxi representatives who walk around readily offering information about their water taxi services to Los Muertos Beach in Puerto Vallarta and back. Those vacationers staying in the Flamingos area will enjoy being able to take a nice leisurely walk north along the beach to the cute little Mexican town of Bucerias. 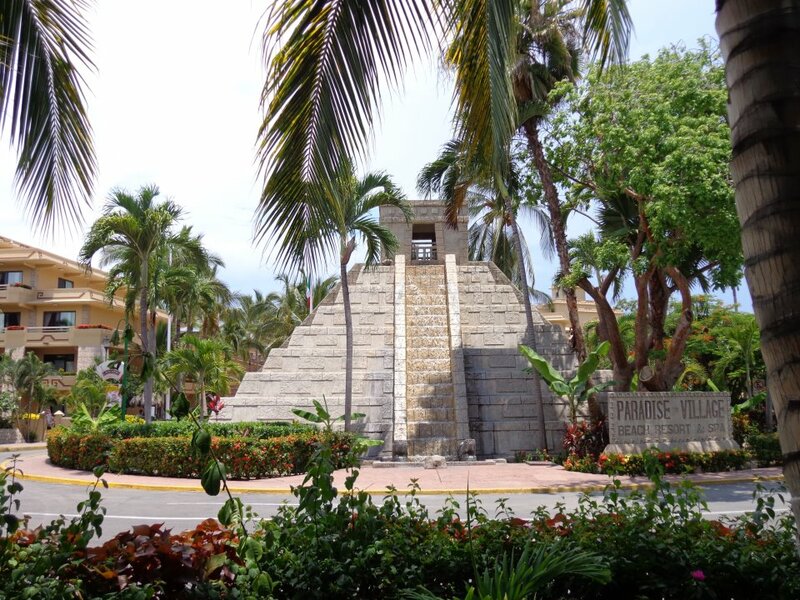 There you will find numerous restaurants, a large open-air flea market, art galleries, a newly remodeled town square, and plenty of eateries along the beachfront. If you’re not up for a 20/30 minute walk along the beach, a taxi ride from Flamingos to Bucerias is a quick 5 minutes or less and is only $85 pesos. Although the public can easily access Flamingos Beach from the neighboring town of Bucerias, for any visitors to Nuevo Vallarta who are not staying in a beachfront resort or condo complex, within the Nuevo Vallarta neighborhood there are only three public access points to Flamingos beach. These three access points are listed below from from south to north, and for your convenience are also marked on the Nuevo Vallarta Map. Between the Vela Vista and Ocean Vista condo complexes, and across from Eddie’s Place Nopal Beach Restaurant. Public parking near the access point are limited to just a few parking spaces (see parking lot photo). This entrance point is perfect for those traveling with friends or relatives who are wheelchair bound as there is a nice wheelchair ramp down to the beach (see photos). This beach access point has a nice beach shower for rinsing off after a swim or an afternoon at the beach. There are nearby restaurant options located along the marina near the beach access point, but not directly on the beach. Just outside the public access point, and across the street, is a public bathroom (see photos). There is also an OXXO within walking distance where you can pick up snacks and cold beverages. 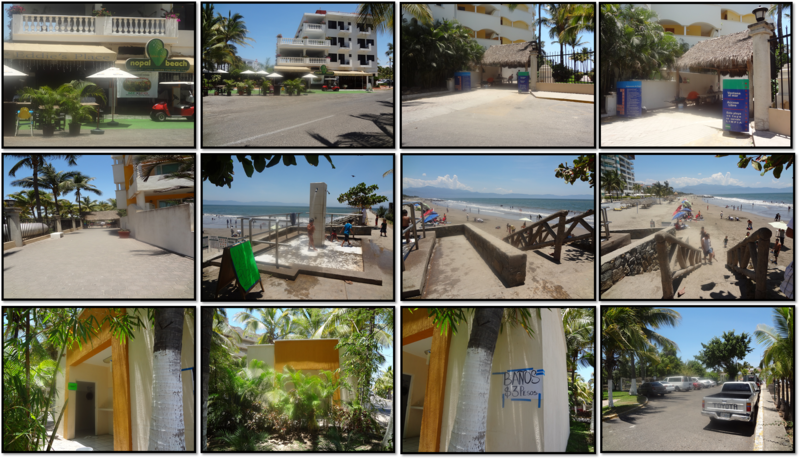 Nuevo Vallarta Public Beach Access Point No. 2. This public access point is directly down the street from the middle entrance (second entrance) to the community of Nuevo Vallarta. Right after circling one-third way around the large round about, just look for the yellow-bar lift gate where there is a guard shack in front of a very small parking lot. The vehicle parking fee is the equivalent of about $3 USD. At this public access point you will find a lovely beachfront swimming pool that is open to the public for a nominal fee. Right behind the swimming pool area there is a small restaurant/bar that is operated during the high-season months and open to the public. Right in front of the swimming pool and beachfront is the lovely Coco Beach Restaurant which is open year round and has been in business for more than 15 years. Between the Kite Towers condo complex and the ETC Beach Club (Restaurant/Bar) there is a public access point to the beach. This access point is usually manned by a security guard who checks that visitors are not bringing glass bottles to the beach. Parking directly in front of this beach access point is limited to a few spaces which are reserved for the patrons of the ETC Beach Club. However, free street parking is ample just down from the Kite Towers condo complex. The ETC Beach Club restaurant has a menu that offers a variety of delicious appetizers, entrees and refreshing drinks at moderate prices. NV Public Access Point #3: Look for ETC sign in front of a small parking lot. Access point is above and to the left of the red pavers (2nd photo) leading to ETC. The beach club photo was taken from the pathway leading to the beach. Final photo shows free and ample street parking.